There were parts of the story I enjoyed, that were well put together and fed me into the band aura, that made me feel I was there with them living the dream. That was the actual touring and writing/creating music and lyrics, it felt very realistic. I love when a book does that, actually incorporates the whole band ethos, rather than just having the lead character be a band member but not actually writing about the scene in a bland, generic way. I liked the band members, and could feel the sizzle between Levi and Brooklyn right from the start. I just felt the first half dragged though, that nothing really happened except Brooklynn joined the band, and we met her sister. The postcards from the title didn’t really play a part until the second half, and I’d a pretty good idea early on who was behind things. 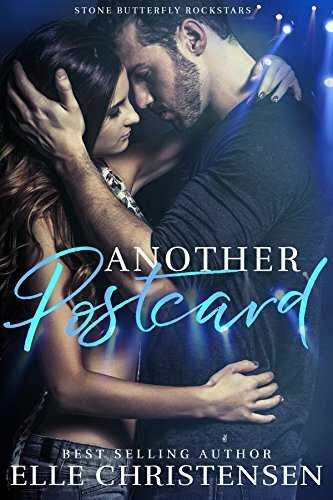 I didn’t really get a sense of danger and suspense from the read, didn’t ever really feel there was any real issues here, and when things did take a turn for the worse it was kind of quickly wrapped up glossed over and tidied up, leaving Brooklynn and Levi free to follow their hearts. That just felt too slick, too easy and I’d have liked a little more reality here. Sorry, a well written read that many will love,but just an OK, nothing special, read for me. Stars: Three, well written story which didn’t play out as I’d hoped.